كانت بداية المشروع من خلال معرض “نور الشكل” بقصر الفنون 2005، حيث قمت بعرض هذه الصورة بشكل ضخم في المعرض إلى جانب عرض أدائي، وقد جازف معي الفنان محمد المصري بتصوير بعض اللقطات، ثم تتالت بعض أعمال الفيديو والتى تناولت فكرة العسكرى بشكل عام. I produced an icon that can be dealt with in different ways. 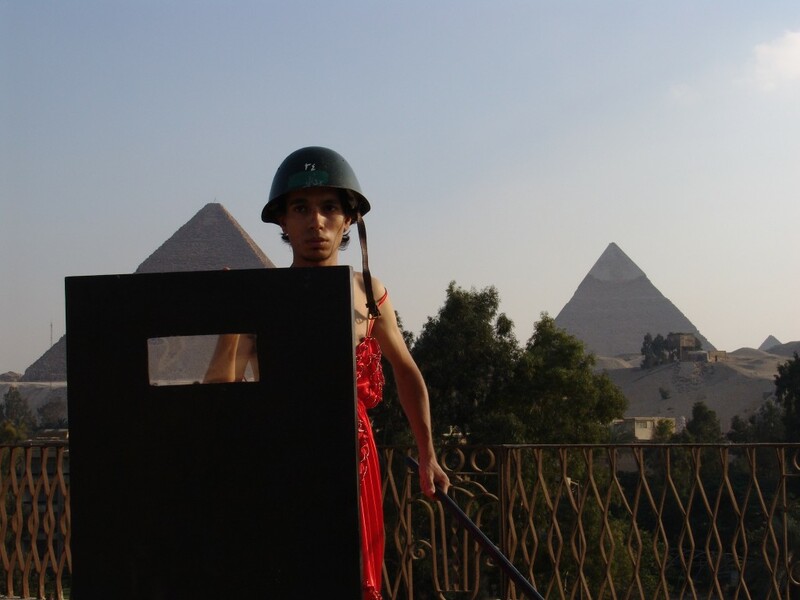 The image was evidently challenging the Egyptian militarised state and its culture of violence. The project started through the “Nour Al Shakl” (Light of Appearance) 2005 exhibition, held at the Palace of Arts, Cairo. During the show, I presented a huge picture accompanied by a performance. The artist Mohamed Al Masry shared the risk by taking some photos. After that experience I produced a series of videos generally tackling military related issues.